Most of you know that I fish 12 months out of the year; any day is a good day to go fishing! But I must confess to you that in the spring wild turkeys distract me. It has been 20+ years ago that I slipped out with my Uncle and Dad on my first spring turkey hunt. We did not have as many turkeys in the state back then, in fact you had to apply for a permit and there were only a limited number of spring turkey permits in just a couple of units in the state. But my Uncle had been hunting turkeys literally since the very first season held in Nebraska, and he had access to some Niobrara valley land where we would have a chance. Before the hunt I had read every magazine article and book on spring turkey hunting that I could find (some of you will be shocked to know that was so long ago we got our information and education from books and magazines instead of the internet!). I figured if we had a good weekend of hunting we would hear one or two gobbles, and if either Dad or I killed a Tom it would be a GREAT weekend. Well, I will never forget that first sunrise. In the darkness my Uncle takes us to the rim of a canyon and as the sky starts to brighten the turkeys started “talking”. There was clucking, yelping, cackling and more gobbling than I dreamt I would hear in my entire lifetime. At first I thought my Uncle was pulling some prank on my Dad and I by positioning us in the dark above someone’s barnyard. But he was not, those were wild turkeys and they were making such a racket that you almost needed ear-plugs. I have been hooked on spring turkey hunting ever since! By mid-morning I had harvested my first Nebraska Merriam’s turkey, it was a jake, and by late afternoon I had called a mature Tom just close enough for my Dad to reach out and knock him over with one of his patented long-shots. Sometime in between those two successful shots there was a sonic boom that got every Tom within ear-shot to gobble; you could hear turkeys gobble up and down the river valley for as far as you could hear. 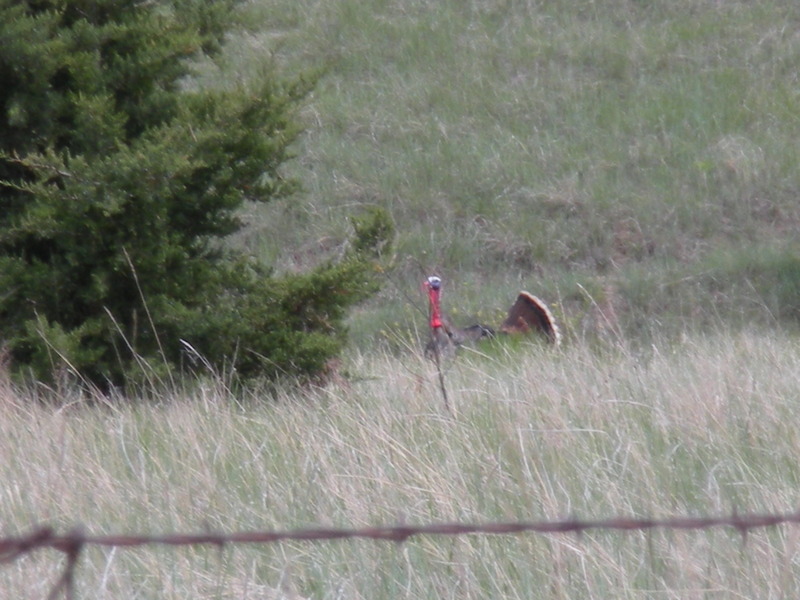 I do not believe I have missed a spring turkey season in Nebraska ever since. There have been a few springs where turkeys were not harvested, but darned few; most springs there are tales to tell and birds to pluck. We are rolling into a period of time now where I need to be “out of the office” for the next several weeks; the fish are biting, the turkeys are gobbling and there will be some mushrooms to pick somewhere in there too. I thought I would commemorate it all with a music video I found on the internet . . .
Just looking at this picture makes my heart rate spike! I can’t wait to receive a photo or two about the hunt. I’ll be blogging about the Game and Parks Fisheries Biologist who went from fins to feathers! Yah he’s a convert! Pretty soon he’ll be doing turkey hunting workshops with us!